This mod adds binary and trinary star system initializers to the game. 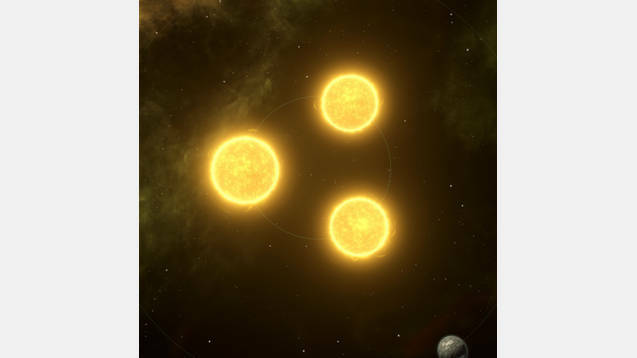 On average, 50% of procedurally-generated systems (including empire homeworlds) will have a single sun, 25% will have two, and 25% will have three. Should be compatible with almost anything, since this mod does not override any vanilla files. There is currently a bug in regards to Frontier Outposts: building them from the galaxy view will construct an FO around all stars in the system. You can get around this by building them from the system view instead, but I will fix this ASAP. And yes, you can build ringworlds and dyson spheres in these systems. But the result looks ugly as sin, so please don’t do it. I only left it as an option because I don’t want to override vanilla files.